On this, the Sixth Sunday of Easter, we begin to turn our eyes toward the coming of the Holy Spirit. In this passage above, Jesus speaks of asking the Father to send another Advocate to be with us always. This Advocate is the Holy Spirit. Interestingly, Jesus uses the title, “Spirit of Truth” to refer to the Holy Spirit. He also points out that the world cannot accept the Holy Spirit. We are currently living in what we may call the “Age of the Holy Spirit.” This is the age that Jesus spoke about with His Apostles. Therefore, it’s good to look at the coming of the Holy Spirit in the way Jesus revealed it. First, regarding the title, “Spirit of Truth,” we should ponder whether we are able and willing to accept the full Truth that comes with receiving the Holy Spirit. If we are of the world, embracing worldly ideas and values, then we will not be able to accept the Holy Spirit. However, if we are able to see the errors of our world and the many false values within it, we will more easily be able to reject those values and embrace the Holy Spirit and the many truths that the Spirit reveals. Furthermore, if we are open to the coming of the Holy Spirit, we will receive the greatest Advocate we can have in life. The Holy Spirit is THE Advocate, meaning, the only helper we need. Becoming consumed by the Holy Spirit provides us with every grace necessary in life. Reflect, today, upon the fact that Jesus’ promise to His Apostles has been fulfilled and that you have the ability to receive that promise here and now in your life. 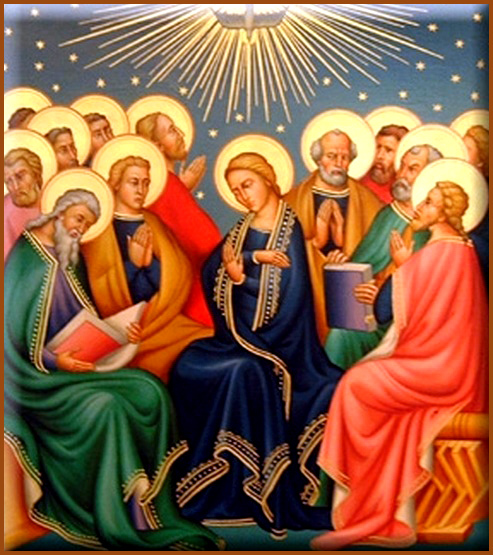 Say a prayer to the Holy Spirit and anticipate celebrating Pentecost Sunday in two weeks. O, God, who by the light of the Holy Spirit, did instruct the hearts of the faithful, grant that by the same Holy Spirit we may be truly wise and ever enjoy His consolations, Through Christ Our Lord, Amen. Jesus, I trust in You.